Posts about the early 80's tabletop role-playing game (RPG) DragonQuest from SPI with random excursions into mapping and Virtual Tabletop use. 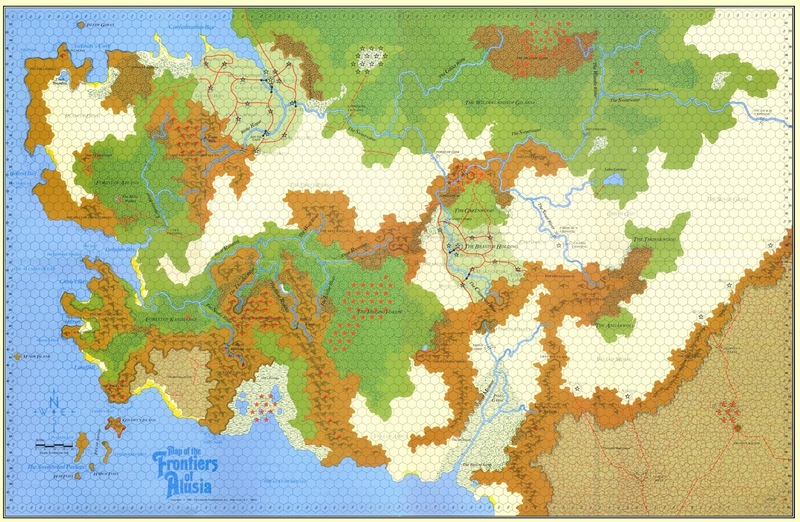 The Frontiers of Alusia is a campaign setting released by SPI for use with DragonQuest or other fantasy RPGs. I've used the Frontiers of Alusia (FoA) as a campaign base for DragonQuest off and on since its release in 1981. The included 22"x34" map has the quality you would expect from the preeminent war game publisher of time. The accompanying Travel Guide provided basic descriptions of the various named areas and features of FoA and included a basic history of the region plus hints about neighboring areas. There are ruins, abandoned cities, impassable mountain ranges, deep dark forests, haunted battlegrounds, primitive cannibals and barbarian tribes. Plenty of adventure hooks and room for GMs to put their own stamp on it. It's a real shame that further expansions for either the Frontiers or Alusia as whole were never produced. In the cover sheet Frontiers of Alusia is described as "a thinly settled, semi-explored wilderness." In keeping with that there are only two settled areas within the Frontiers of Alusia: the Barony of Carzala and the Brastor Holding. They cover about 4% of the total area. If you've read any of my previous blog posts then you know that I like to dig into the numbers and I collected a few for the Frontiers of Alusia. 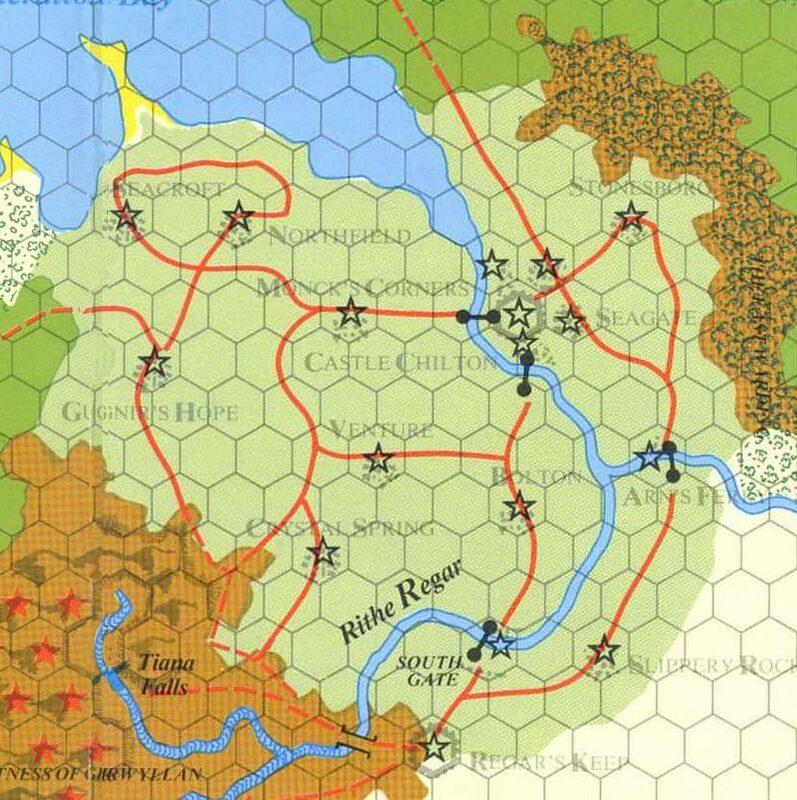 The map itself is 63 rows of 85 or 84 hexes each of which is 5 miles across. That's 5324 hexes at ~21.65 square miles per hex or 115,265 square miles. Subtracting out the ~774 hexes that are ocean/sea you end up with a total land area of ~98,508 sq. miles. Close to the same size as the state of Oregon here in the USA or a bit bigger than the United Kingdom. That's quite a bit of area to go adventuring within. The Barony of Carzala is described as "an area of rich pastures and fruitful plowed fields" and "about 12,000 people make their homes within the Barony". Counting only the hexes on the map identified as fields and thus within the barony and we get 124 hexes or 2685 sq. miles. This gives us a population density of ~4.5 people per square mile. That's really low for an area described as rich and fruitful and settled for somewhere between 60 and 100 or so years. That's only 11% of the population density of England & Wales during the Black Death. Remember also that I only counted the hexes identified as field which the cover sheet described as including "all cultivated fields, vineyards, moors, heaths, etc., (usually near inhabited areas)." Twelve towns are named within Carzala and the populations that are given for each conveniently add up to the 12,000 figure for the barony as a whole. So clearly that number is only for the those living in towns. Scotland during the middle ages was pretty sparsely populated and if we use its average density of ~13 people/sq. mi. then Carzala would have an overall population of 34,905 with 22,905 of those living in villages, hamlets and other outlying areas surrounding the identified population centers. 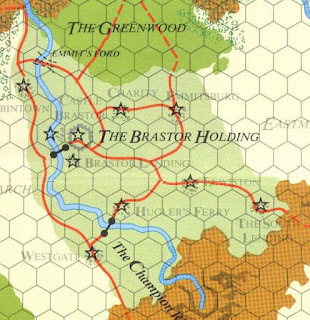 The Brastor Holding is smaller with 65 hexes or ~1407 sq. miles. 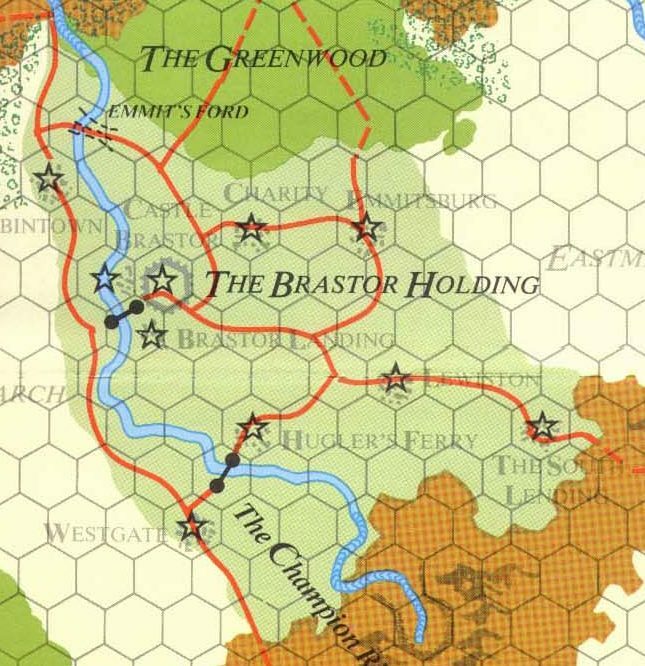 The FoA Travel Guide also provides the names and populations of the towns shown on the map which once again sum up to the total of 5000 given for the Brastor Holding as a whole. The guide tells us that Brastor Holding was settled 60 years ago and is likely more thinly settled than Carzala. Using the 11th thru 13th c. population density for Scotland of 10 as a base, Brastor Holding would have about 14,070 residents. 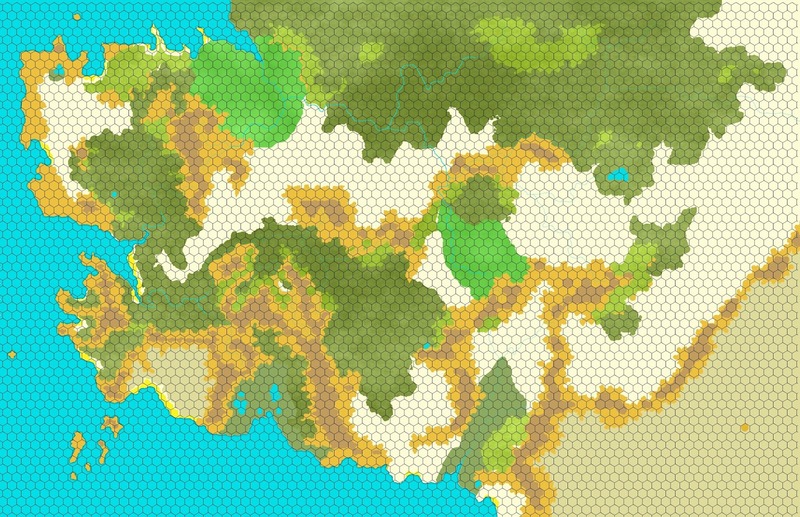 A while ago I got tired of trying to edit out map details I didn't want the players to have and worked up a copy in Gimp that wouldn't have anything other than terrain. Here are versions with and without the hex grid. For those wanting to load this into a VTT like MapTool they are 58 px/hex. [2017-02-24] I should also mention that the Seagate Guild of Adventurers has a number of maps expanding on FoA available on their site. Snafaru's web site has maps expanding the area just north of FoA. Very cool work! So cool see things about DQ popping up here and there. Thanks Charles! DQ is still the only fantasy RPG I run. Demographics made easy is/was my go to for info on population density. Another is this paper (https://dspace.mit.edu/handle/1721.1/11311 ) on MIT's site about a thesis looking at city densities throughout history. Useful stuff. Given less than a century of settlement, it is perhaps not entirely surprising that most of the population would be in settlements. They might well be living in a central hamlet and then venturing out to their individual fields during the day. For a newly settled region, this would be a better survival approach than scattering across the landscape, particularly if there are still many dangers in the area. It would be true that most would be in settlements and these would be villages and hamlets. Towns arise only when there is sufficient population to support the craftsmen and the like who do not spend their days in fields tending crops. Saying that the population density for an area like Brastor Landing is 3.55 people/sq. mi. doesn't imply that the population is evenly distributed across the landscape. It is simply a measure of population density. I'm only pointing out that information given in the guide doesn't make sense as stated and with only what is stated. A single hex encompasses 13,856 acres. Per the guide there are only 5000 souls in all of Brastor Holding. Just a few hexes would be all that they could reasonably hold or manage if there were still many dangers in the area. Certainly not the 65 hexes indicated on the map nor with the only population centers spread so widely. This situation is not unique to FoA, as the majority of fantasy campaign settings have no grounding in how populations grow and spread in a actual medieval culture. Does it matter? No, not really. A little bit of grounding in how the population of a medieval society is distributed can impart verisimilitude to a campaign setting however.